1720 Sportsboat racing in the Coastal fleet. 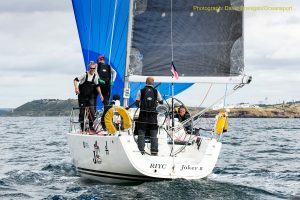 Joker 2 skippered by Commandant Barry Byrne winning the Fastnet Race for the Beaufort Cup. 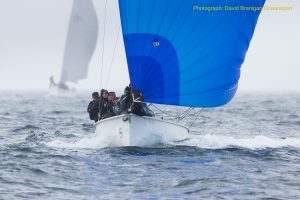 The Irish Defence Force team, racing J/109 Joker 2, skippered by Barry Byrne, opened their defence of the Beaufort Cup with a win in the 150 mile Fastnet Race. After digging in for trench warfare, with a beat all the way to the Fastnet Rock, Joker was fourth around the iconic lighthouse, and picked off the leaders to take the gun by just over four minutes from the Baltimore Lifeboat team skippered by Youen Jacob. The Baltimore Lifeboat team, with Olympian Peter O’Leary calling tactics staged their own comeback, sailing offshore into extra breeze to move up the ranks and threaten the leaders. 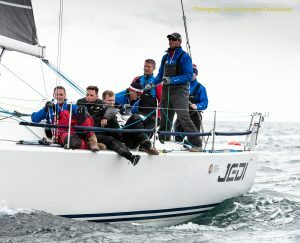 Tánaiste Simon Coveney (Deputy Prime Minister of Ireland) racing J/109 Jedi, with an Irish Defence Force Team, led the fleet for much of the race, but lost out in the last few hours to come third. 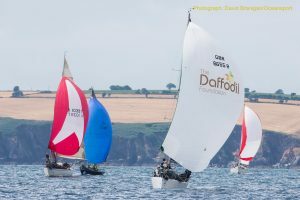 The Fastnet Race is a double scoring race for the Beaufort Cup, three days of inshore racing will decide the overall winner, who will also nominate a donation of 10000 Euros to the charity of their choice. Brian Griffin’s Stonehaven Racing (right) from Killaloe Sailing Club. 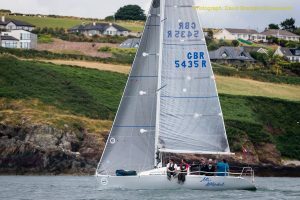 In IRC Three, Ronan & John Downing’s Half Tonner Miss Whiplash (Royal Cork YC) won Race 2, crossing the finish line just four seconds ahead of Wright, Cronnelly & DeNeve’s Corby 27 Kodachi (Howth YC). “The team did a good job today, especially on the beat where we can suffer against some of the boats in our class.” commented Ronan Downing. “I would say that the wind was up for most of the race, but there was one light patch where we positioned the boat well to get through.” Volvo Cork Week Chairman Kieran O’Connell is one of the crew on Miss Whiplash, Kieran was excused from boat wash down today, only on account of providing a case of Heineken for the team! Congratulations to all of today’s class winners including: Rory Fekkes’s Quarter Tonner Fn’Gr8 (Carrickfergus SC), Denis Hewitt & Ors’ Mills 36 Raptor (Royal Irish YC), Broadhead, Collins & Stuart’s Sigma 38 Persistance (Royal Irish YC), Donal & O’Mahony’s Loch Greine (Royal Cork YC), and Patrick Doherty’s Tailte (NSYS & RCYC).